Warmun is one of the main centres for east Kimberley Aboriginal art. It is a small Aboriginal community, 200 kilometres south of Kununurra in far north Western Australia. It was known as Turkey Creek for many years, but has reverted to the Aboriginal name for the area. The main language of the region is Gija. The community is home to nearly 600 people, mainly Gija speakers, but also includes Aboriginal people from other language groups. To see where Warmun and the various other places referred to below are located, click on the Kimberley Map link (opens in a new browser window). While Warmun is located in the east Kimberley, there is no sharp boundary separating the cultures of the west Kimberley, where Wandjina images are dominant in traditional art, from the east. Similarly, there is no sharp boundary separating desert cultures to the south and south west, where there are strong connections to Kukatja, Jaru and Walmajarri people, or to the east. Nevertheless, east Kimberley paintings, with their planes of brown, black and yellow ochre defined by white and black dots, are strikingly different from central and western desert paintings. Kimberley artists paint maps of their country and look beneath the surface to the structure of the land. Within this distinctive vision of their country, artists often include ancestor figures and modern or historical events of significance to their community. Warmun has been the focus of much interest in Kimberley art over the last twenty years because of the emergence of a number of highly successful artists, the most famous of whom are Rover Thomas and Queenie McKenzie as well as George Mung Mung, Patrick Mung Mung, Paddy Jaminji, Hector Jandany, Beerbee Mungnari and Jack Britten. The history of the Warmun community has been summarised by Judith Ryan in the book “Images of Power”. In the last two decades of the 19th century, the Gija people were forced off their lands by pastoralists, including through massacre and poisoning. The first fifty years of white settlement, starting in the later 1800s, resulted in the death of perhaps half the Aboriginal people of the east Kimberley, either through murder, armed conflict, disease or malnutrition. The Government of Western Australia responded to this desperate situation by setting up a ration depot at Turkey Creek in 1901. 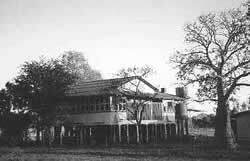 A decade later assimilation centres at Moola Bulla and Violet Valley were established. The Chief Protector of Aborigines, as the senior government official was called, was AO Neville, appointed in 1915. Neville wanted to take control of church-run missions and turn them into self-supporting cattle stations. However, indigenous families did not willingly move to these settlements. To compel people to move, the Aborigines Department refused rations or other help to people living away from the settlements. In response to complaints from local police about camps on the outskirts of non-indigenous towns, Aboriginal people were `rounded up’ by police and sent to the settlements. These were depressing places for many Aboriginal people and they were eventually sold to Europeans as pastoral leases (Violet Valley in 1943 and Moola Bulla in 1955). The history since then for Gija people has been one of working and living on pastoral properties, interspersed with enforced moves and relocation, and homelessness. 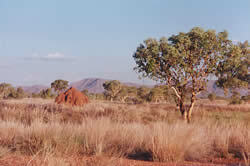 The Gija people, with government assistance, established the Warmun community in the 1970s at Turkey Creek, near the old Violet Valley Station. This has regained for them a measure of control over their lives. Art at Warmun evolved in the late 1970s from the painted boards used in the Gija people’s Krill Krill song-dance cycle. The Krill Krill ceremony was revealed to Rover Thomas after the death of a woman to whom he was spiritually related in 1974. About a month after her death, Rover Thomas was visited by her spirit and she gave him a series of songs and dances about her travels after her death, visiting many sites of sacred or historical importance in the Kimberley. After several years of his telling these stories, they evolved into a song and dance ceremony called Krill Krill performed by the Warmun community. This ceremony included the carrying of painted boards by dancers. These boards initially were painted by Thomas’s uncle Paddy Jaminji, under Rover Thomas’ instructions, and only several years later did Rover Thomas take up painting independently himself. These paintings led to the remarkable growth of the east Kimberley style of painting. In the late 1970s and early 1980s the artists of Warmun were increasingly productive, but they had no organised means to sell their work. Waringarri arts in Kununurra was the first Aboriginal art centre to be established in the Kimberley to meet this need. It was initiated in 1985, and officially opened in 1988 as an outlet for Kimberley Aboriginal artists under their own control. Waringarri was instrumental in helping to establish the reputation of artists such as Rover Thomas, Queenie McKenzie, Jack Britten, Paddy Carlton and Freddy Timms. For nearly ten years Waringarri was the only arts-related business owned and controlled by Aboriginal people in the Kimberley. The centre now works mainly with Mirriwoong artists from the Kununurra region (since the Warmun centre was established) and artists from the central Kimberley. Warmun Art Centre was established in 1998, to represent Warmun artists and market their work to collectors, museums and galleries world-wide. In its first few years of activity the Warmun Art Centre operated out of a converted old building but it now has a large purpose-built centre that opened in 2007. The building was funded substantially from Art Centre profits. Artists from Warmun and associated communities are renowned for their use of natural ochre and pigments on canvas, which is integral to the expression of their Gija culture and connection to country. The artists draw on traditional Ngarrangkarni (Dreaming) stories as well as contemporary events and experiences of the artists. The newer generations of Warmun artists still work with natural ochre and earth pigments, and bring a high level of enthusiasm, innovation and freshness to their work. Internationally renowned ochre painters Lena Nyadbi, Patrick Mung Mung, Mabel Juli, Shirley Purdie, Madigan Thomas, Gordon Barney, Phyllis Thomas, Churchill Cann and Betty Carrington lead the way for a group of more than sixty emerging and younger artists currently painting for the centre.